User interface plays a major role in defining a mobile app and in producing a good visual impact on the user. A dull, boring and undefined user interface may result in the abandon of the app. Thus, UI is the key factor that boosts the performance and defines the success of the app. It is therefore essential to hire the designers and developers who work creatively to design an attractive mobile app. The best way to create a tempting mobile app is to add the right kind of animation to it. Although adding animation makes the working and loading of app bit slow but it is a powerful tool to gain users' attention. It makes your app popular hence increasing the number of users. Although designers work their best to create a seamless mobile app since sometimes loading pages and images takes time. The users do not like waiting for long and might withdraw using your app. It is therefore good to add short animations that do not consume much time of the users. Introducing the right kind of animation without adding useless graphics and designs help in creating the best and user-friendly app. It is one of the most important animations for mobile app, web app and a website. It is defined as producing a quick response of a function in an app on interaction by the user. A change in color on being pressed by the user depicts good visual feedback and points towards seamless app function. Visual feedback is something that defines the proper function of the mobile app. Of course, the user would love to get a quick reaction in response to the interaction they made with the app while using it. Previously an app contains a menu with the list of app sections but this feature does not go well when the app is complicated and has a complex design. This has increased the need for a way of adding animation. A good and imperative animation works as a visual navigator. Different features are displayed on the screen in the form of animation, the user can swipe or shift the picture to change sections. This not only produces a good user experience but also provides an eye-catching view to the user using the app. Some of the navigational options commonly used in the animation are hamburger, sliders or sticky bars etc. Although fun animation not offers much good experience and may complicate the development of an app but introducing a unique and visual animation makes your app stand out. It works as a secret tool that makes the app recognizable. Also, its interesting and fun features attract potential users and made them fall in love with your product. While creating a fun animation, the designer should not avoid including features of applications and should take care of the important functions and aspects while designing a fun animation. Custom animation is designed for specific apps and contains certain customized features that influence the customers to use your app. It also plays a major role in branding your product thus increasing the number of users. An app performs different functions like uploading of documents, photos, sending messages and many more. For each of the function performed, there are different types of animations that demonstrate the type of process running at a time. It offers a good picture and presentation of the app and offers a great user experience. It has been concluded that right and creative mobile or web app animation provide great user experience thus contributing significantly to define an app. It is very important to pay attention to every minute detail of the app while designing in order to produce seamless interaction of the user with the app. 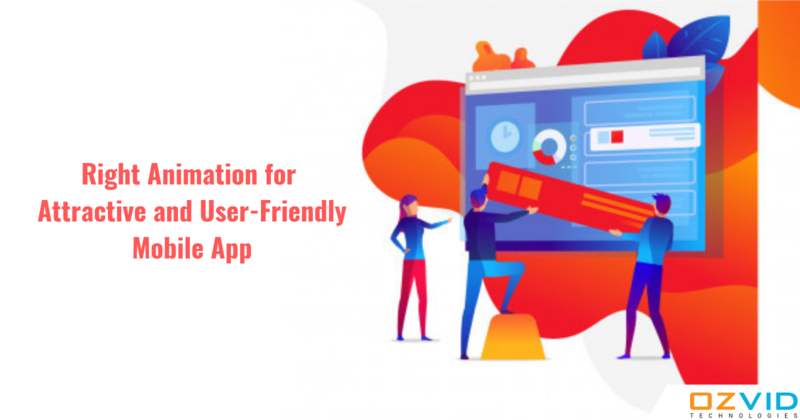 The growing trends with time increase expectation of the users and therefore it is crucial to make sure that your mobile app and animation is designed to meet their needs. If you are thinking of creating an app or updating an existing app then get desirable results by meeting the highly potential team of designers and developers of OZVID Technologies. The team of expert designers understand your business needs and work creatively to produce the best user experience.